Every American president has surrounded himself with political advisors. 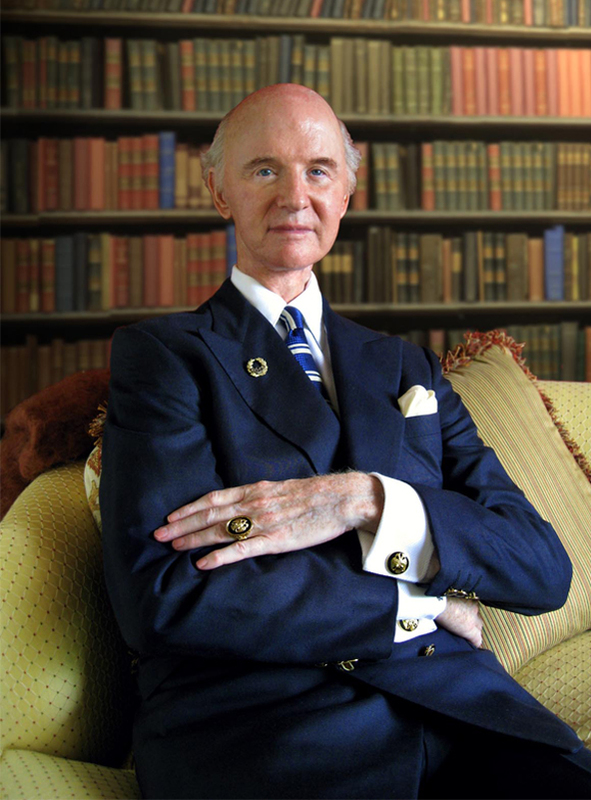 But one man has been lucky – and talented – enough to serve as fashion advisor to no less than four presidents. That man is Martin Greenfield. 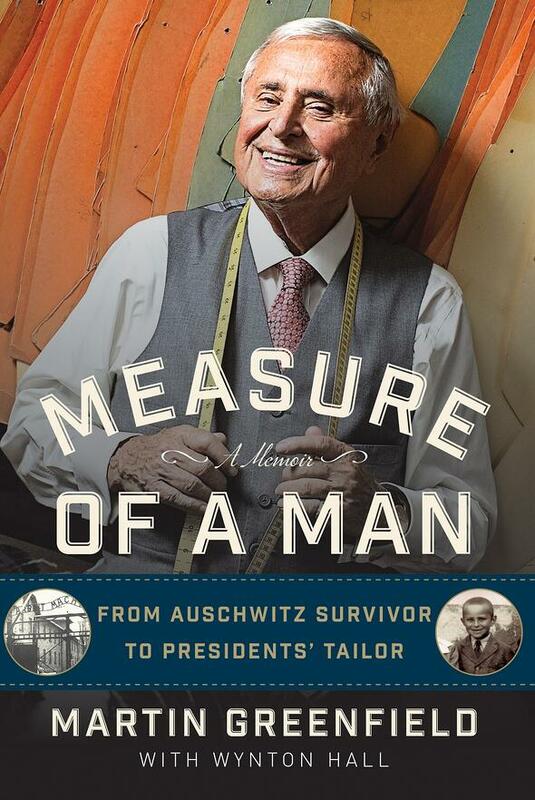 Who would have imagined that the teen who survived Auschwitz would eventually become a renowned tailor – not only to presidents but a host of entertainers, sports celebrities and other public figures? Ironically, it was at Auschwitz where young Martin, born Maximillian Grunfeld, learned to sew. He and his parents, sisters, tiny brother and grandparents were taken from their Czechoslovakia home and shipped to the Nazi concentration camp when he was 15. Martin was put to work in the laundry room, where he repaired garments. At one point, he retrieved an SS shirt from the trash, re-stitched it and proceeded to wear it in secret under his camp uniform. 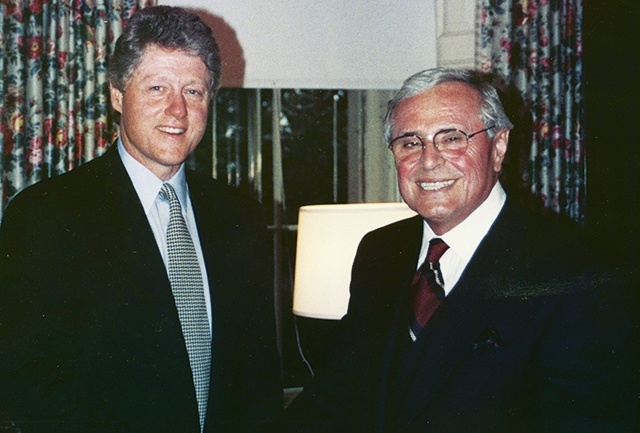 GREENFIELD WITH BILL CLINTON DURING A FITTING IN CLINTON'S WHITE HOUSE BEDROOM. GREENFIELD'S FIRST IMPRESSION OF CLINTON'S CLOSET, "THIS HAS TO BE ONE OF THE MOST PATHETIC PRESIDENTIAL WARDROBES IN AMERICAN HISTORY." Martin was the only member of his family who left Auschwitz. Late in World War II, he was transferred to Buchenwald, via a brutal 50-march through the snow. The camp was liberated by American soldiers in April 1945. With no idea all his immediate family were dead, Martin searched for them for two years. He immigrated to New York, where another Czech refugee helped him get a job sweeping the floor at GGG Clothing. Under the tutelage of owner William Goldman, Martin honed his sewing skills, learning every detail of custom clothing craftsmanship. His reputation as a very fine tailor continued to grow, and General Dwight Eisenhower became his first big-name client, at the time he was running for president. That was a poignant success for Greenfield, who recalls shaking Eisenhower’s hand during the liberation of Buchenwald. He purchased GGG Clothing in 1977, giving the firm his own name. At the time, the company had six employees; today it has more than a hundred. 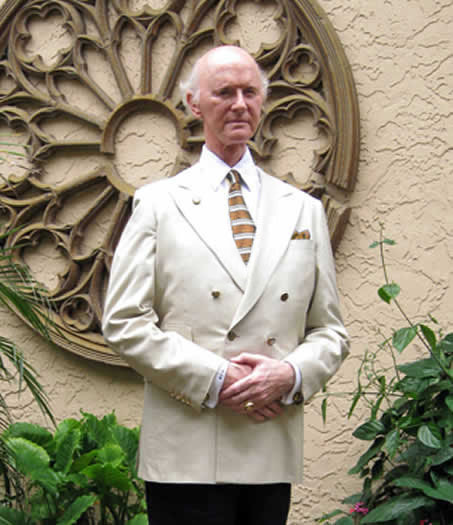 Besides Eisenhower, Greenfield has crafted beautiful hand-crafted suits for Presidents Ford, Clinton and Obama. Other clients have run the gamut from Paul Newman and Shaquille O’Neal to Michael Jackson, Al Pacino, Jimmy Fallon, Johnny Depp, Cardinal Edward Egan and General Colin Powell. 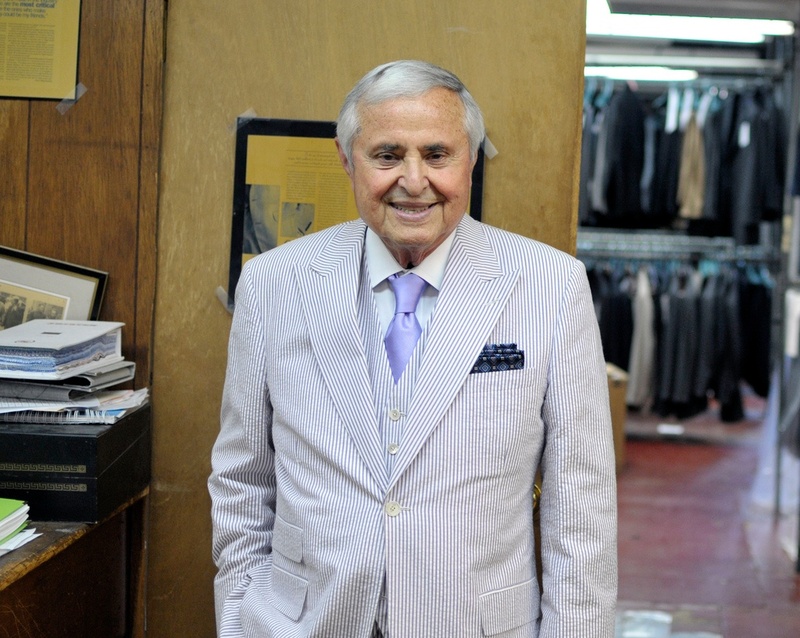 Through the years, Greenfield and his employees have produced suits for Hollywood film and television characters as well as “real” customers. His company also contracts with high-end retailers such as Brooks Brothers, Neiman Marcus and DKNY to make suits for their clientele. 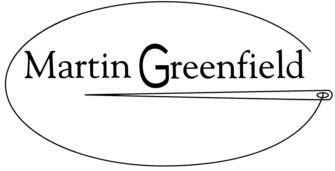 Now well into his 80s, Martin Greenfield has published a memoir entitled “Measure of a Man,” in which he tells his horrifying and compelling life story. Michael Jackson, the King of Pop, shows his hands-on approach to managing his important career. Remember, this is a man that has changed the history of music and dance ~~ forever. The, at last, location of this historically important draft press release will be of interest to many on this globe. Mr. Jackson has, on July the 4th (or the 3rd), 1985, reviewed his own press release and obviously does not totally approve of what the staff of Patrick Kelly Productions is about to submit for global release. 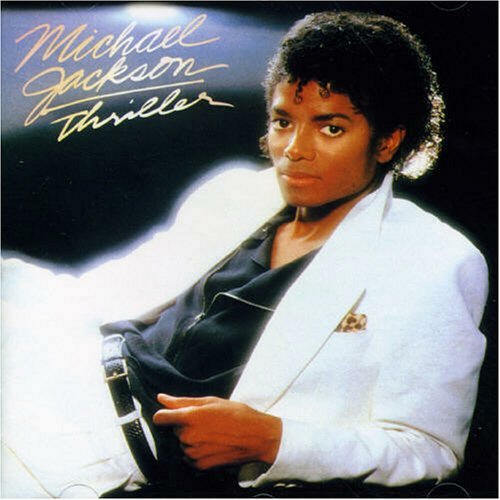 MJ reveals his management style and his own displeasure with these rare notes by personally correcting in the following way – “Add L.A. star on Hollywood”, etc, and, “making Thriller the biggest selling album of all time – M.J. 7-3-85.” Also, Michael Jackson has highlighted certain phrases to emphasize just what he feels must be important. One can see the business and management skills of this young 27 year old Michael. A rare contribution to music history is featured here as authored by Michael Jackson himself. 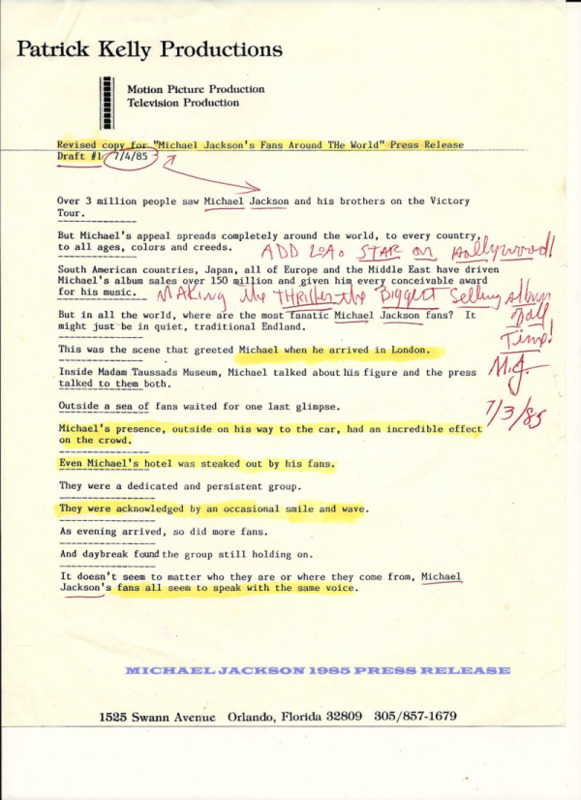 To understand the importance and historical significance of this Michael Jackson manuscript, as meticulously corrected by the King of Pop, the reader should understand the context of the time. This important press release was authored not long after MJ and the Jackson Five’s major “VICTORY TOUR”. 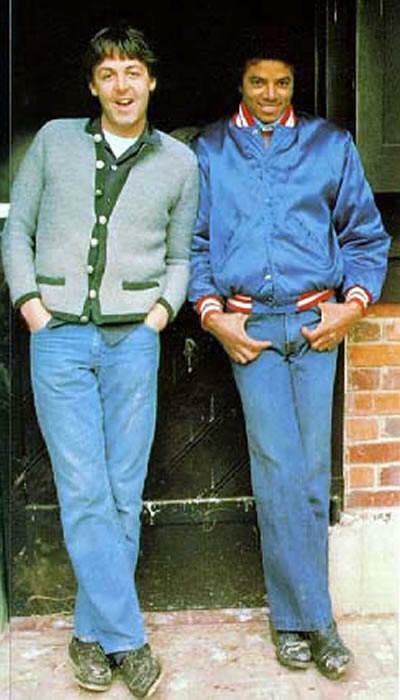 The Jackson Brothers tour, lead by Michael Jackson, toured and preformed 55 amazing concerts. The Victory Tour also played to 2 million paying fans and grossed a then record of 75 million dollars. This was the last time the Jackson Brothers were to tour together; and, the Victory Tour featured two of Michael Jackson’s famous trademarks ~~ his one-hand, single decorated glove and his inovative Moonwalk Dance movements - MJ's Forever Changing The History of Dance. This is an important museum M.J. hand-authored and corrected find. It clearly illustrates the hands-on approach of one of the single biggest talents ever to appear on any stage anywhere in this entire global sphere ~~ Michael Jackson. Presently, this and other hand written notes or original art, by Michael Jackson, are in The Collection of Raleigh DeGeer Amyx AKA The American Heritage Collection.